Doing no good to bees whatsoever, was the pretty bee hotel sitting on a shelf in my potting shed. I have to admit I liked seeing it there, this birthday gift from a very dear friend. It made me think of her. However, this has been the month of June when The Wildlife Trusts having been encouraging everyone to do something wild for nature. It’s time the bees got their new residence here, especially as there their numbers are increasing in the garden just now. Yesterday it went up! 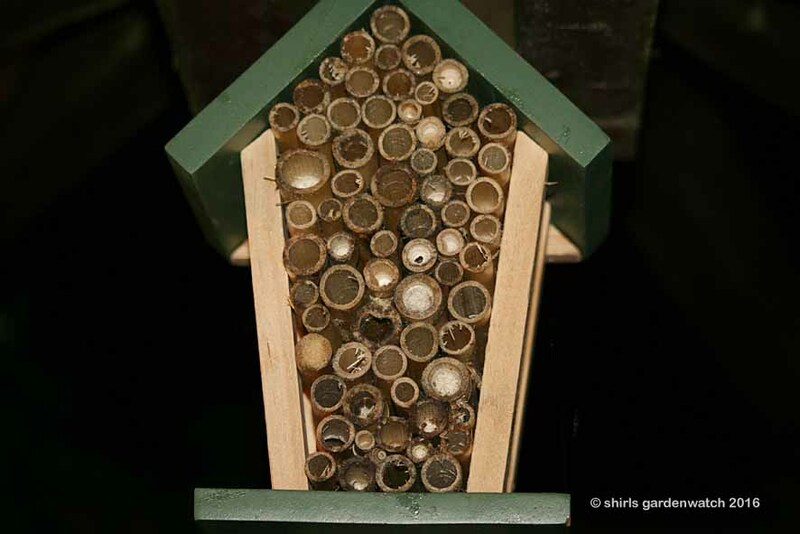 The Bee Hotel tonight, I forgot to take day images during my potting shed tidy. I'm wondering if visitors have arrived already - the third row from the bottom? Perhaps it was lucky I was using a flash tonight. What do you think – are there two guests staying tonight? That was tricky, with slippery rocks and uneven ground below. I’m thinking now I can confirm one guest tonight - gosh that was quick! Update July 1st : Since posting this, the images of the canes in my bee hotel looking less fresh have been bothering me. I made a few internet searches to see if this was a problem. I guess it’s obvious that all garden wildlife properties require annual maintenance. We do clean nest boxes at the end of the year to remove parasites from an old nest so it makes sense that a bee hotel should get checked too. I’m now going to take mine down and see if I can replace a few canes. I found a blog by George Pilkington at Nurturing Nature very informative. There’s a brief insert below. 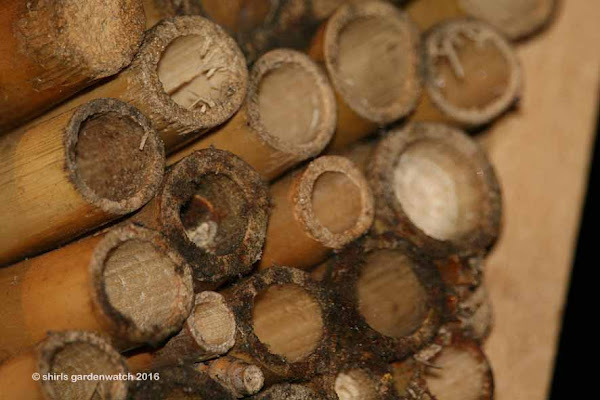 Bamboo tubes are tough, waterproof, cheap and cheerful and should be changed annualy. They are easily replaced and with experience, time spent cutting, sorting re lengths, width etc., can be made to work very well and allows for management of bee cocoons. Inserting paper rolls inside is fiddly and any gaps can allow wasps to enter, bamboo diameters can be variable. Many shop bought ones have nodes halfway down making them smaller or even blocked by a node at the entrance! Many of these are simply too wide and again act like wind tunnels. The brittle sharp edges have not been clean cut and are not very friendly to bee wings! 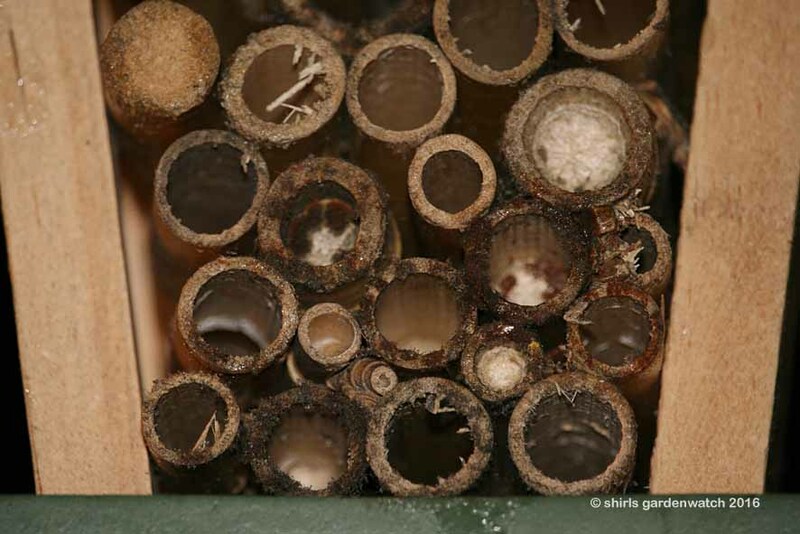 Any cracks or splits would be exploited by parasitic wasps. Great stuff. I must check mine after dark as I've never seen any activity during the day.